Taking our inspiration from a quotation in Fluid Mechanics: An Interactive Text (Version 0.60) by Liggett and Caughey, we decided to use pipes in our strategy to effectively deliver the mineral payload to the truck. Using 10 feet of 3/4" inner diameter PVC conduit, we constructed a series of pipes to carry and deliver the cargo. 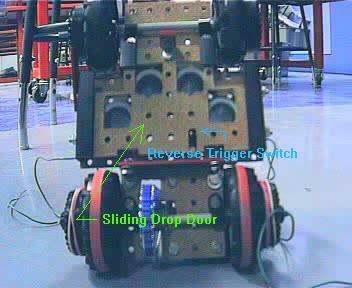 The payload drop is regulated by a sliding "trap door" using innovative Connect Four technology. This approach has been implemented to insure a high accuracy of delivery. 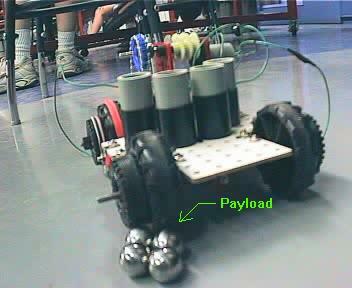 The walls of the PVC pipe cause little friction, providing a smooth and rapid release of the steel payload. Also, the use of vertical pipes is effective in conserving surface area on the body of the vehicle. The transporter has been designed to deliver twice the minimum cargo load.